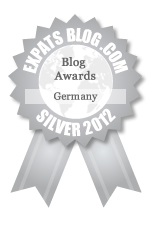 ExpatsBlog.com Expat Blog Awards 2012: Germany Silver Award! This blog won the Silver Award for best expat blog in Germany! As a German I love this blog. Laurel's insights of life in Germany are spot on and I love reading about her adventures. Laurel is one of my favorite bloggers, and I love her perspective as she wanders around Europe! Reading Laurel's posts, I feel as if I'm right there with her. Laurel has a great sense of adventure and that's reflected in her writing. She's an outdoors enthusiast who has embraced life in Germany. Her blogs are a pleasure to read. I always enjoy reading about Laurel's adventures! She takes me to destinations I probably won't ever get to and also introduces me to new places to visit in one of my favorite places, Germany. I love Laurel's blog. It's witty, she makes fun of herself all the time and provides practical tips for her readers. Entertaining and useful. Whether Laurel is sharing insider tips and perspectives of life in Germany or writing about travel adventures, she's got my interest. Her blog is full of well-written and engaging stories that keep me coming back. Laurels blog is an escape from the mundane. With her very Canadian easiness and good sense of humor she takes the reader along on every journey and adventure. I inspire to visit every location and follow in her footsteps. If you're looking for the lesser known (and maybe even secret) little beauty spots in Germany, look no further than this blog. I love going along with Laurel on her adventures! She is one of the most daredevil bloggers out there. Her pictures are gorgeous, and I always look forward to reading where she is off to next. Laurel gives us, her readers, the refreshing and amusing point of view of a Canadian about life in Germany. I'm pretty sure Laurel is trying to kill herself with some of the adventures she's undertaking these days, but in the meantime it makes for some really entertaining reading. If you want to learn about life in Germany with a little bit of adrenaline thrown in, this is your blog. A really fun travel blog with quality writing that showcases Laurel's travels around the globe. Love it! Been following Laurel's blog for over two years now. She's one of our favourites, especially as we're such fans of Germany. Her posts tempt us to go back there, particularly to the lesser known regiaons, as well as the other places she blogs about, too. Laurel's blog is a great adventure every time I click on her site. If you love traveling and want personal, accurate information than you should definitely put her on your RSS feeder! great blog, great person and great traveler. we share similar tastes and I love reading about Laurel's travel experiences. Adventure and thrills are what you usually find in Laurel's articles and although I have never been to most of the places that she writes about, I find her introductions, insights and photography inspiring nonetheless. I have followed her for about 2 years now and have never been underwhelmed with the adventures I find on her sight. Laurel has a real talent for immersing her readers into her adventures and allowing all of us to live and travel vicariously for the moment. Almost daily, I recommend her articles to my followers and friends because of the wanderlust they ignite! Monkeys and Mountains is a funny and informative blog that constantly makes me want to follow in Laurel's footsteps and have the same adventures! I love reading Laurels blogs. If I am in need of a mountain getaway I always know where to look. If I can't make it there at least I see the wonderful places she posts. I've been following Laurel's blog almost since the beginning. Her passion for travel and adventurous spirit shine through in her writing and inspire people to step outside their own comfort zones and experience this exciting, colorful world. Monkeys and Mountains is one of my favorite blogs. Laurel captures in a really vivid way all her travels and makes me want to visit these places as well. Well-written and instructive: Laurel takes us all around the world with her fun articles! A great read every time. I've been reading Monkeys and Mountains since it was Expat in Germany, and it's been one of my favorites. Laurel provides a great perspective on many different aspects of Germany and elsewhere.